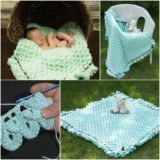 When it comes to our primary crafting skills, we’ve always been very good at embroidery based techniques like needlework, ribbon embroidery, patch making, and cross stitching. That does take time and it means there are a bunch of supplies that become outdated over the years. We thought about donating the older supplies, which we will certainly still do with the few that are still in good condition. 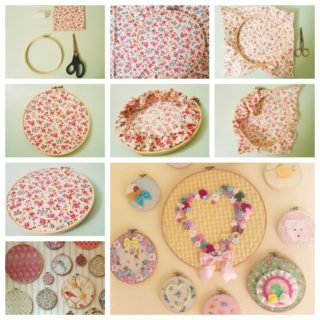 Rather than throwing out the completely worn out ones, however, we hopped online to look up whether fellow crafters and DIY enthusiasts have found any creative ways of upcycling their old embroidery hoops into other crafts! 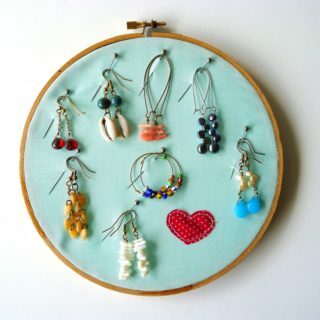 Just in case you’re as interested in the idea of crafting with your old embroidery hoops as we were, take a look at these 15 fantastic and innovative craft ideas, designs, and tutorials! 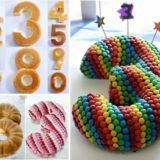 As an avid crafter and DIY enthusiast, have you made several types of wreaths in your time, meaning you’re always on the lookout for even more new ways to create adorable decor pieces like the ones you’ve tried, only more unique? 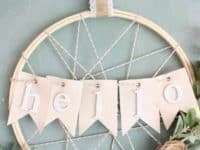 Then we’d absolutely suggest taking a look at how My Life From Home made a more simplistic looking farmhouse inspired greeting wreath that uses string and an embroidery hoop to look almost like the wheel of an old fashioned wagon. 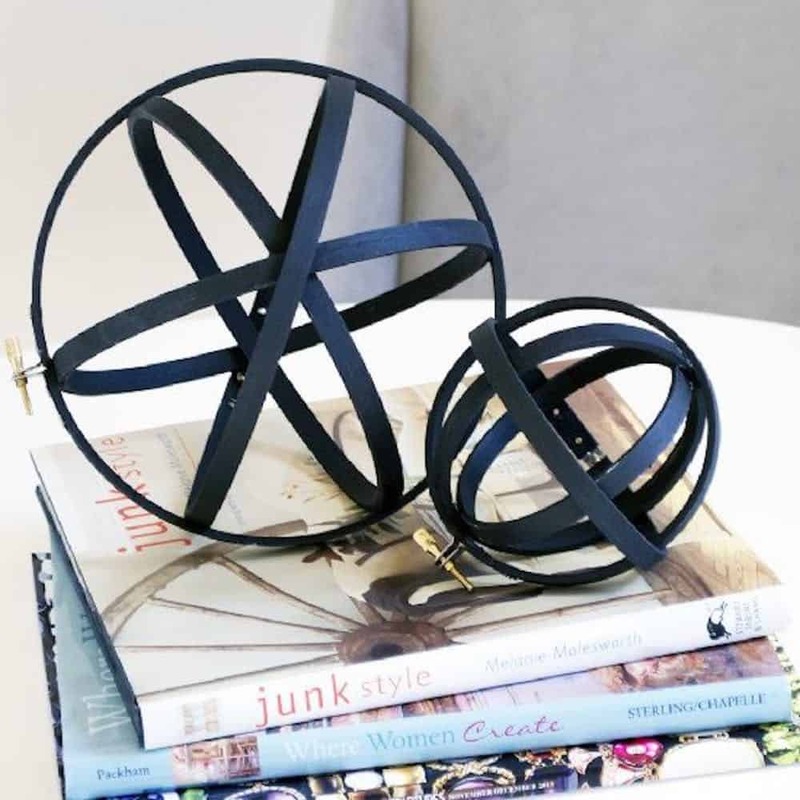 Have you actually got one or two decorative frame hoops that are a little more unique in their shape and you just haven’t gotten around to using them yet? 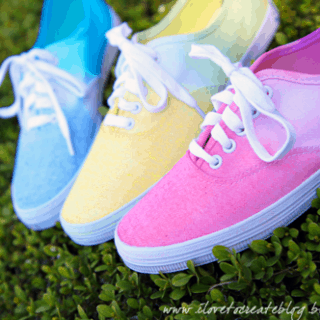 Then maybe you’d prefer to actually finally put them to good use for their originally intended purpose: embroidery! Check out how Crafts Unleashed made this stunningly simple 3D flower art by embroidering the stems but creating the petals from cut fabric and the flower centres from little upcycled buttons. 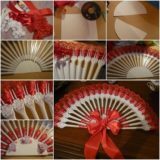 Did you actually enjoy the wagon wheel inspired hoop wreath so much that you find you’re still thinking about it several ideas later, but you quite enjoy starting your fall decor crafting early, around this time of year, so you were actually hoping to find a more autumn inspired idea when it comes to DIY pieces like wreaths? 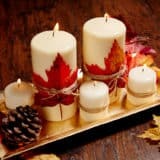 In that case, we’d definitely encourage you to take a look at how Craft, Blog, Grow used similar techniques and materials as the idea you saw before but string cute felt leaves in fall colours along the ropes instead of a greeting bunting. 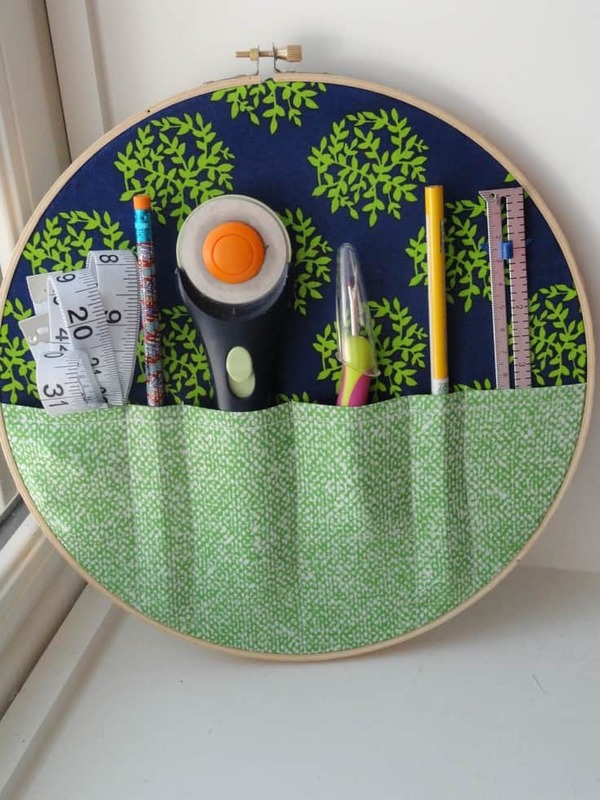 If you’re going to go to the trouble of upcycling an embroidery hoop very creatively, would you rather repurpose it into something practical that you think you might actually use? 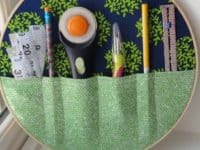 In that case, we think you might get a real kick out of how Decozilla made this adorable craft supply organizer by sewing pockets onto some scrap fabric, stretching that setup into the hoop, and arranging key sewing supplies inside so they can hang where they’re always within reach. 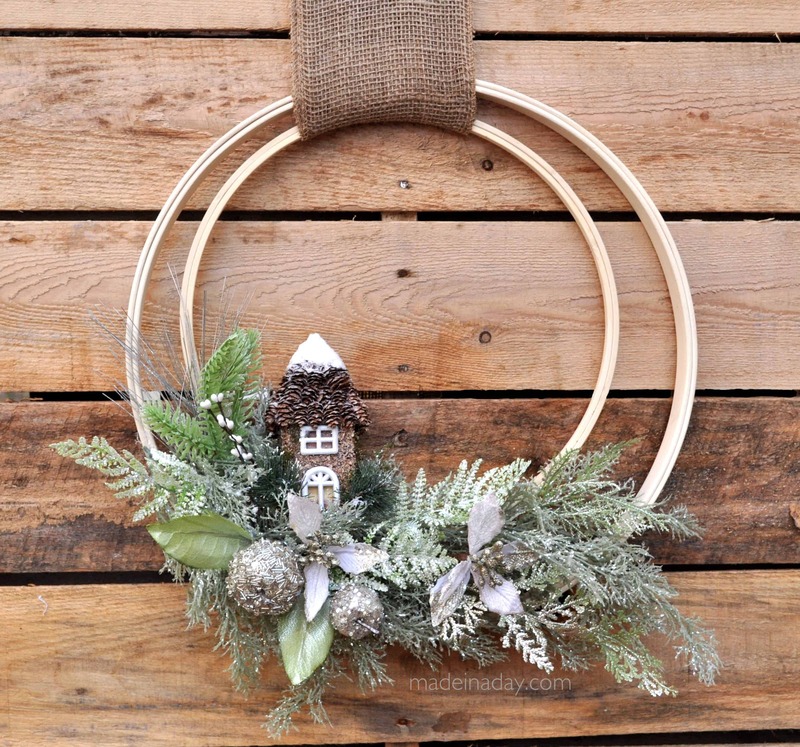 Just in case our other suggestions have made you fall so hard in love with the idea of minimalist hoop wreaths that you think you might be interested in making one for every single season this year, here’s a winter idea for you to try your hand at making well in advance! Check out how Made in A Day layered a smaller hoop within a bigger one and added some silver and sparkling winter greenery to really set the tone and reflect the weather outside. Besides embroidery, we’ve actually taken up another hobby that we’re very much enjoying lately, and that’s succulent based crafting! 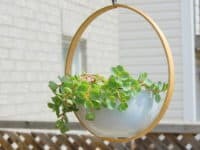 Whether we’re embellishing the planters for our actual succulents or making faux succulents from other crafting materials, we just find them so low maintenance and adorable that they’re dotted all over our home. 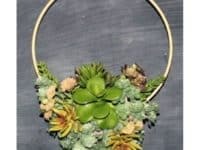 That’s probably why this super cute embroidery hoop succulent wreath that’s covered in a fun cascade of the little green darlings caught our eye so well! 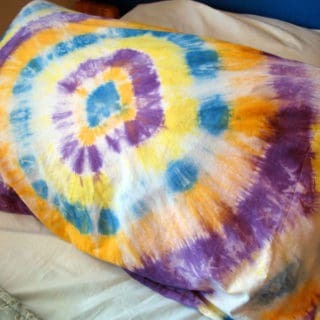 Check it out in more detail on Hometalk. 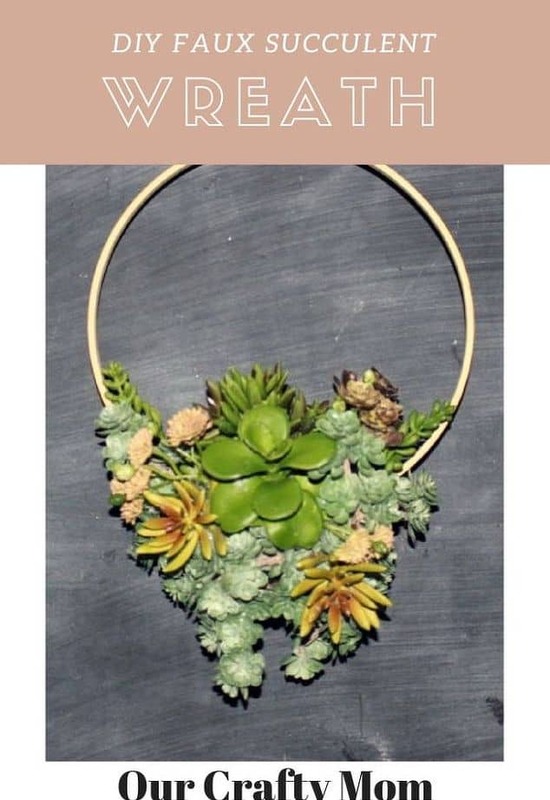 Have we caught your attention very well indeed with our suggestion for combining houseplants and embroidery hoop crafts but your favourite (or maybe your only) plant is actually one that’s big enough to requite a proper planter? 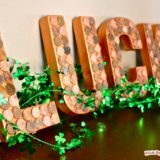 Well, don’t worry, because you’re not out of luck just yet! 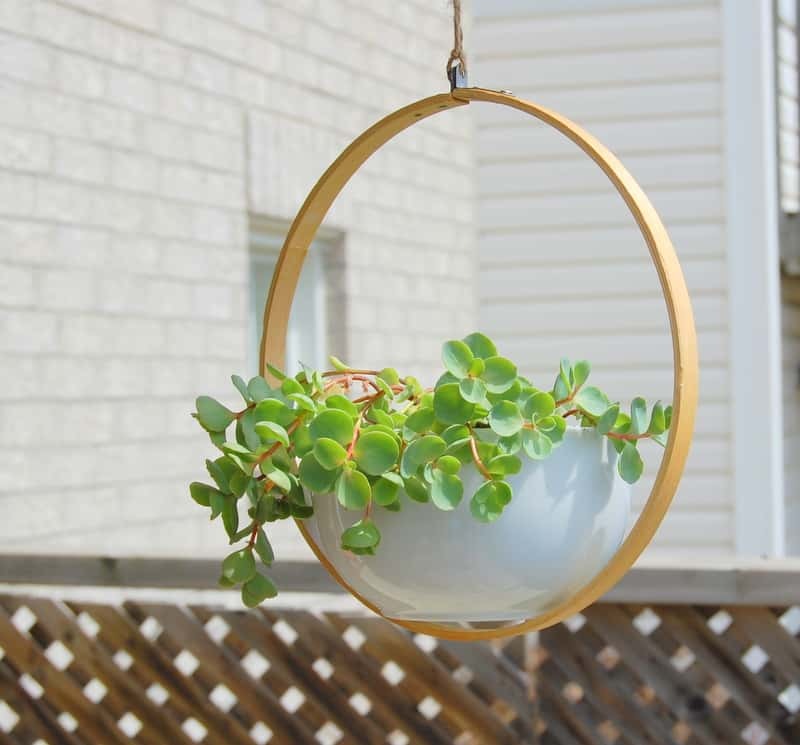 Take a look at how Think Crafts mounted a bowl within a wide, large sized embroidery hoop in order to give their houseplant a modern looking place to… dare we say it… hang out. 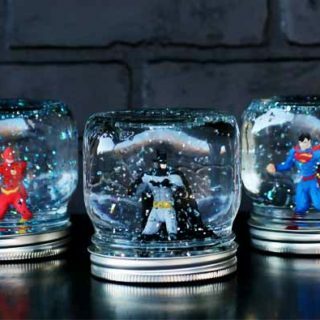 Are you the kind of crafty parent who starts collecting seasonal and holiday DIY tutorials to help your kids get creative with all year, but you stockpile them in advance so that you’re ready at a moment’s notice when the times for those themes come? 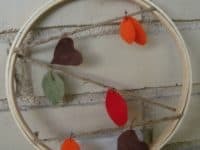 In that case, we’d absolutely suggest taking a look at how Cute Kids Finds made these completely adorable embroidery hoop Valentine’s Day crafts… that actually involved simple embroidery! 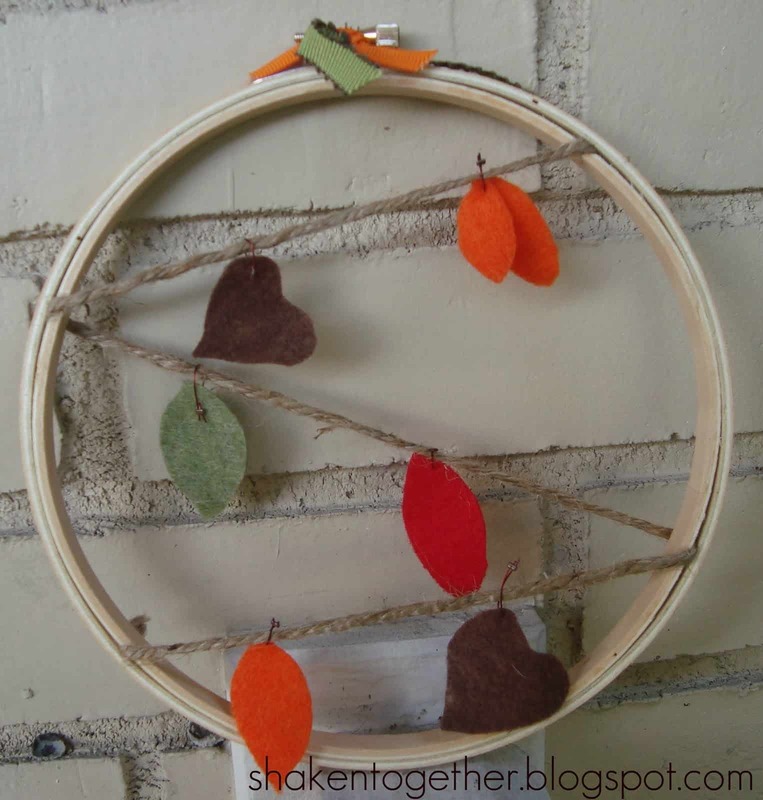 This cute embellishing idea is a great way to teach your kids about the first few basics of hand stitching and sewing. 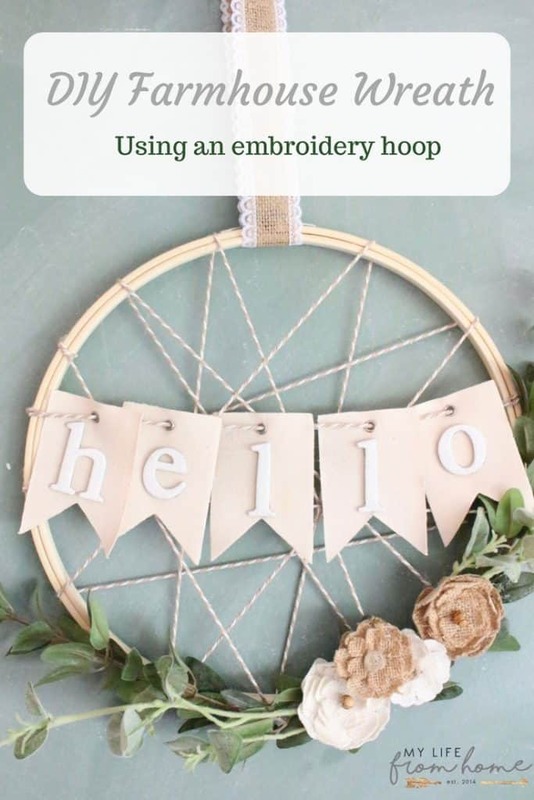 Are you still thinking about what we said when we mentioned that embroidery hoops are a great opportunity to get crafting by way of combining them with other household items and supplies that you’ve been looking to upcycle? In that case, we think you’re going to get along very well indeed with this awesome hoop and t-shirt repurposing art featured on Small For Big! 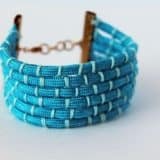 They show you how to stretch a piece of an old t-shirt you don’t wear anymore but still like the design of into the hoop, as well as how to add some more style with things like fringe, feathers, and beading. 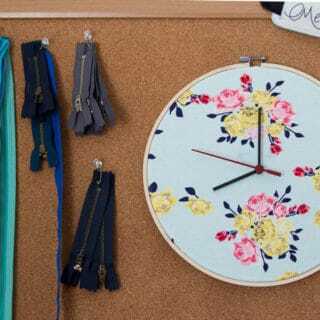 Perhaps the number one crafting supply that you’ve got available for repurposing right now because your embroidery hoops themselves is actually a whole box of scrap fabric that you’ve been accumulating for years from all of your various sewing projects? 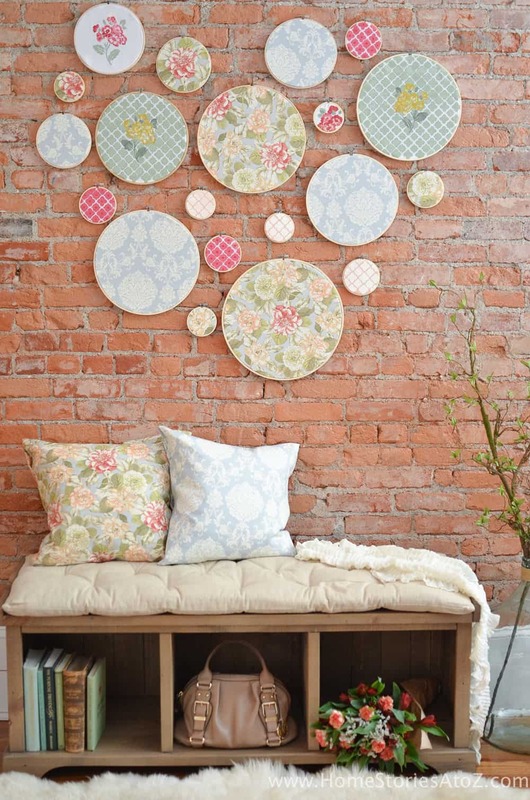 Well, if you’ve got a large array of each thing, then you sound like the perfect person to give this stretched fabric wall art idea featured on Home Stories A to Z a try! 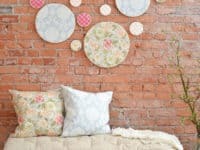 Even if you only have enough to make a few, rather than enough to make an entire wall collage in differing sizes, the pieces will still look adorable once you’ve got them mounted. 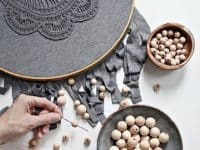 Perhaps rather than combining your embroidery hoops with a range of materials, you’d actually be a little more interested in the idea of combining your embroidery skills themselves with some of the other DIY techniques you’ve mastered over the years? 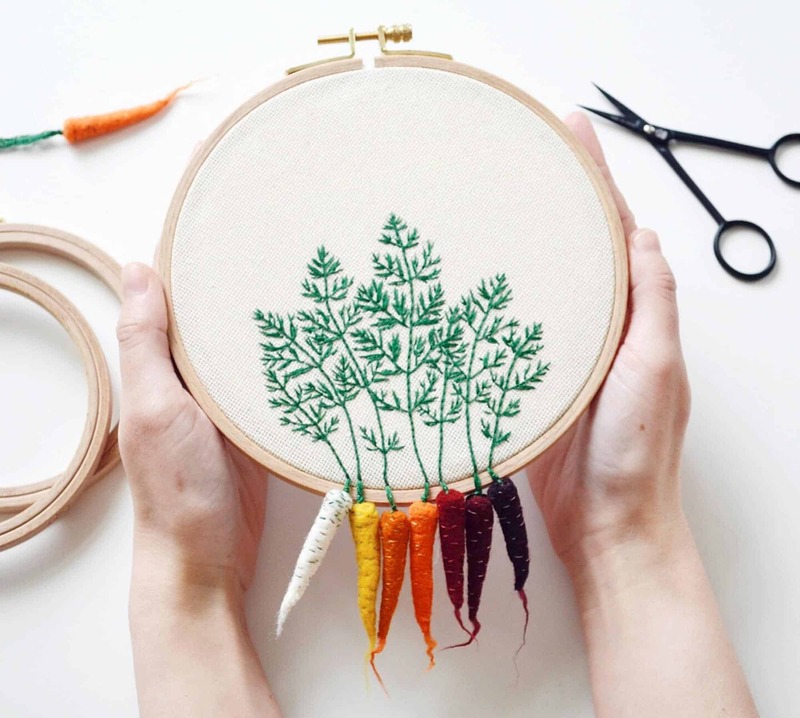 Well, if you’ve ever tried needle felting, then we’d absolutely suggest taking a look at how Illusion created this adorable hanging carrots art by embroidery the stems, felting the veggies, and stitching them along the edge of the hoop so they hang off like they’re still rooted in the ground. It’s surprisingly visually impressive for how simple the techniques are! 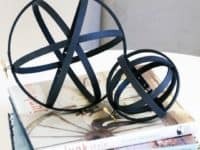 Despite your tendency to make everything yourself and how that often combines with your love for upcycling things, do you actually have a great appreciation for art pieces that look a little more modern than the average homemade craft? 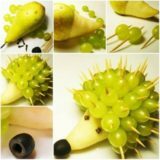 Well, just because you’re making something yourself doesn’t mean it can’t mimic the art you’d find in stores, even if you’re using supplies that come from your own collection of DIY tools. 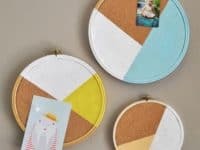 This awesome spherical multi-hoop art that Blitsy created by looping several painted embroidery hoops through themselves is the perfect example of what we mean. 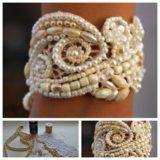 Despite having all these embroidery hoops from your needlework days, have you actually moved on to other types of crafts and you find that you prefer crafting with harder, more structured materials lately? Well, 2Modern has found a unique way to combine those two ideas and we definitely think it’s worth your time to take a look! 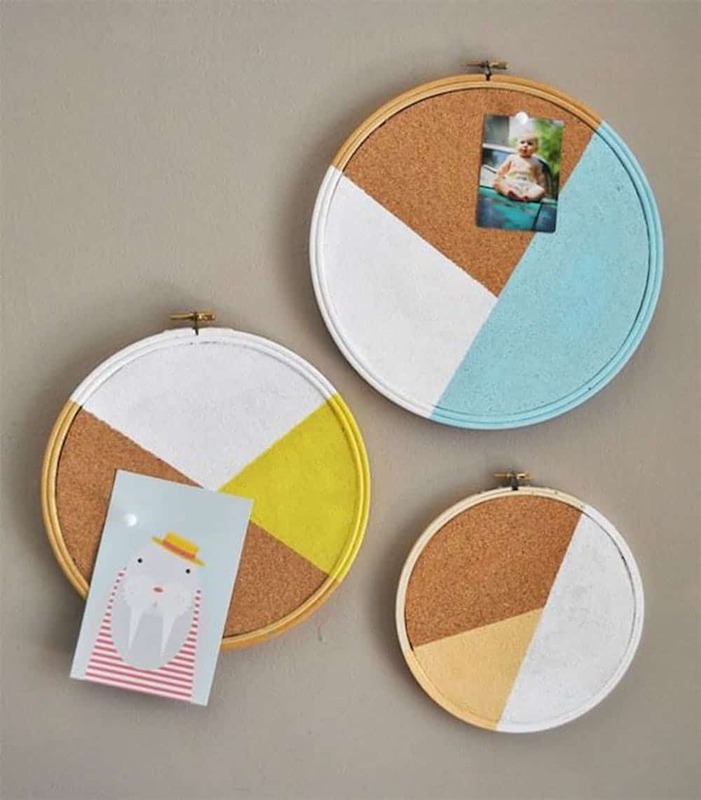 Their tutorial shows you how to fill the space within the hoop with a perfectly size piece of cork, as well as how to paint neatly lined geometric colour segments, in order to make a miniature note board that’s great for hanging by the phone or above your kids’ homework desks. 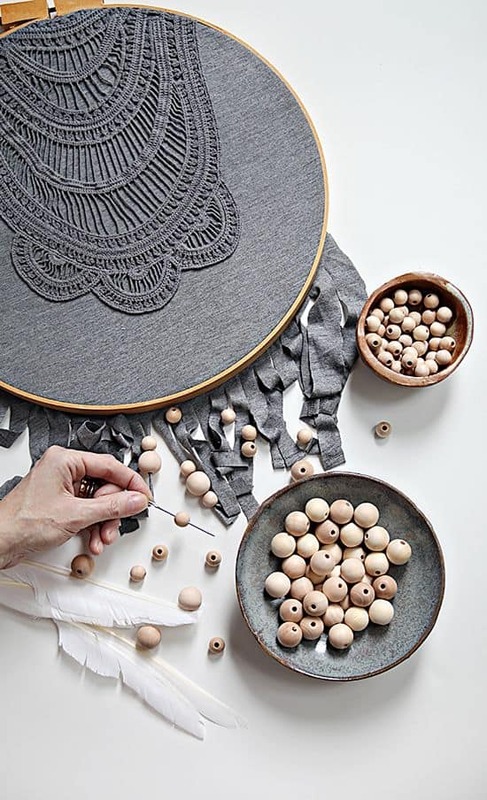 If you’re going to make something by hand, would you actually prefer that it be something purely decorative and very pretty, since delicate things are a little more in line with your personal sense of style and your current home decor scheme? 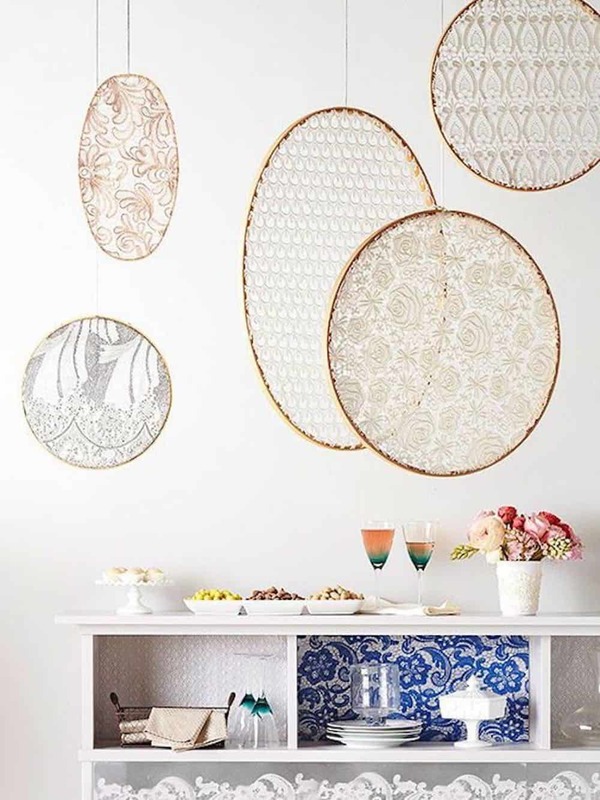 In that case, we think you sound like you just might be the perfect person to give these absolutely stunning stretched lace and embroidery hoop hangers a try! 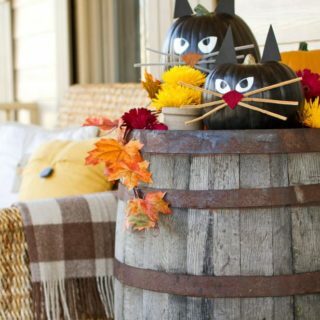 Get the full details for making some of your own on BHG! 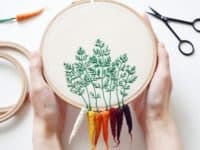 Did we really catch your attention when we briefly mentioned the idea of needle felting earlier on our list, but you’re actually so in love with needle felting lately that you’d almost prefer a hoop craft idea that’s a little heavier on the felting part of the whole concept than the little embroidered carrots you saw earlier on our list? In that case, we think we’ve found something that just might be a little more up your alley! 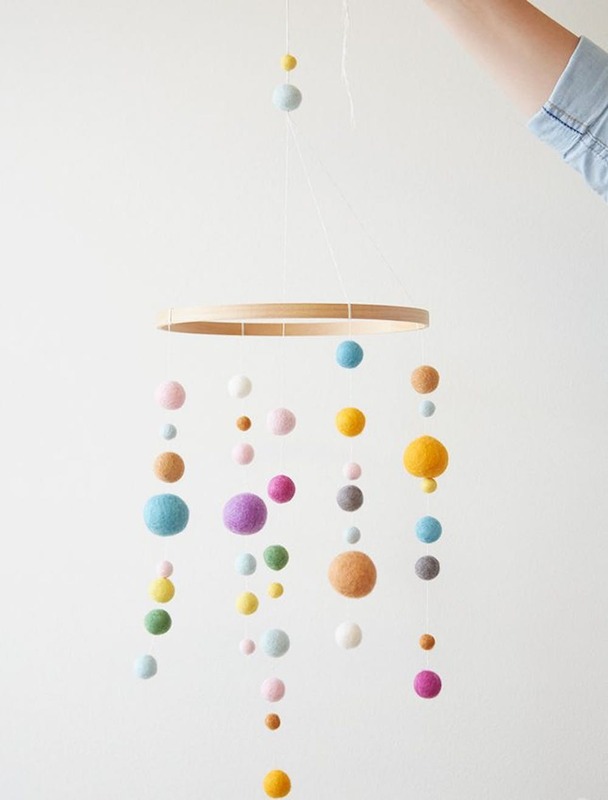 Check out how Think Make Share created this fantastic hanging mobile that’s built on an embroidery hoop base but embellished with needle felted balls in all kinds of colours and sizes.